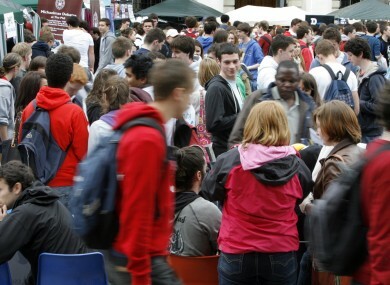 Students at Trinity College's Freshers' Week last year. The HEA has warned that colleges will need significantly higher funding if they are to cater for growth in the national population. STUDENT CONTRIBUTIONS to the cost of third-level education may be doubled – at least – within two years as surging demand leads to a funding crisis in higher education. The Higher Education Authority says there is “a real warning” that the government’s ambition to provide a high-quality education system, when combined with the predicted increase in demand as the population grows, mean the current level of funding is not sustainable. HEA chief executive Tom Boland told RTÉ’s Morning Ireland that its agenda was to ensure the “best possible high-quality education system to meet the needs of Ireland”, an agenda within which the funding question was particularly difficult. “The warning is a real warning,” Boland said. “We cannot continue with a policy where we are decreasing funding and increasing participation in higher education. Boland said the ESRI had been commissioned to undertake a study predicting exactly how the national demographics would effect growth, but said all indicators pointed to “very significant growth in demand” for college places. If this demand was to be catered to, he said, the current funding model – where EU students are asked to pay €2,250 in a contribution fee, with the HEA paying the balance – was not sustainable. “That level of investment in the medium to long term will not be sufficient to meet the demand for higher education,” Boland bluntly warned. “That situation cannot continue. If we want a quality higher education system, we need to be able to find a way to fund it. Proposals on adjusting the funding model are currently being compiled by the HEA on foot of last year’s Hunt Report outlining the general future of higher education. While any major reform is unlikely this year, given that the 2012 Budget did not outline any huge transformations to the education system, Boland indicated that the following year could see the charges surge. The Irish Times this morning predicts that the student contribution could potentially reach €5,000, while the Irish Independent suggests the fee could surge as high as €6,000. “We are where we are, in that the budgets are fixed for this year, and probably for the next year,” Boland said. Union of Students in Ireland president Gary Redmond said previous increases in the registration fee had not resulted in increased overall funding for colleges, as the government had deducted college funding each time that students were made to contribute more. “USI and students across the coutnry absolutely accept that we have to do more with less,” Redmond said, but warned that many talented students were already being kept from college given the €2,250 charge already in place. A special congress held yesterday saw USI reaffirm its stance that all college education should be funded entirely by the taxpayer, with students narrowly choosing the ‘free fees’ system instead of endorsing the student contribution system currently in place. Email “Students’ college fees could rocket within two years”. Feedback on “Students’ college fees could rocket within two years”.